IN the time before time on island called Mata Nui six ROBOTS were washed to shore, they were: tahu: Curatious Toa of fire. Lewa: Agile Toa of air. Gali: Noble Toa of water. Kopaka: Powerfull Toa of ice. Onua: Wise Toa of earth. Pohatu: Mighty Toa of stone. When Tahu got washed up on the shore and got built he had no memory of were he came from, it also happened to the other 5 Toa, Because Tahu did not know his name he got stressed and started to try to melt his body but, the amount of friction in it stopped it from melting. Tahu just walked away still didn't know his name or anything infact, but the only thing Tahu knew was to destroy the Borhok and return Mata Nui to peace. "but how do i get the Borohk an where are they?!?!" Tahu said a but confused "and where do i come from, who am i!" after Tahu was really,really stressed he found a village it looked like a big volcano but Tahu was wondering if its his village or not since he knew nothing and just comeing to life "if this is the place this is the place" said Tahu and went in the village just then a Matoran came out his name was Jaller. "hello" said Jaller "follow me" When tahu was following Jaller into the village he saw this mask it was a great gold kanohi mask. "BANG!!!!" A borhok flew into the village and was attacking all the Matoran and other villagers. "BOOM!!!!!" " AHHHHH a Borhok" said Jaller "AHHHHHH" Then Jaller said "go on Tahu your a Toa you can handle it!" "ok ill try" said Tahu. Bang!!! Tahu had shot the Borhok and blown it completely and aswell there was a Kanohi Mask flew though in the air, and Tahu caught it. "oooooo whats this" said Tahu "looks pretty shiny" Then Jaller came out. "Yes it is quite shiny" said Jaller convindced "but who's Mask is this?" "Uhhh looks like Hewkii's Mask" said Jaller. "Who's Hewkii?" said Tahu "Wait and see just wait and see" said Jaller "and we are goning to Return Hewkii's and im going to show you a nother Toa "Whats his name?" "Pohatu" said Jaller. "Oh look the wall of history" said Jaller "wa-all-istry" said Tahu not knowing what Jaller just said. "The wall of history" said Jaller "Right the wall of history" said Tahu corectly. "And by the way" said Tahu "who built it?" "Kopeke" said Jaller "Ok, where is the wall of history" said Tahu. "In front of you oviously" said Jaller. "Here yep, Right here"
Chapter 5: Tahu likes the look of the wall of history. "WOW!!!!!" said Tahu nearly scaring the life out of Jaller "this is amazing!" "I know" said Jaller. "And look there's my two friends Hahli and Takua" "oh thats not Takua" said Jaller disapointedly. "But thats Hahli" said Jaller. As Jaller walked of to meet Hahli and speak to her Tahu went down the wall or history to a nother place that Tahu didn't know but he liked it though and he thought to himself "that wall of history's good but im gonna find something better round here". As Tahu walked down 32 stairs he came to a green place with a round thing in the middle "Whats this?" said Tahu "crrrrr ching" "crrrrrrr ching errrrrrrrrrr tooot"
"iv got you now Borhok, your going down!" "IM gonna beat you, you Borhok" said Tahu bravely "EERN CHING CHINT ERRRREEEM" the borhok said. "stop that silly talk and get on with it Borhok" Said Tahu "TAHU!!" said Jaller. "run!!" "no im fighting this guy!" Tahu said. "tahu its too dangerous" said jaller with all his breath. "Hes going to get you" said jaller's friend Hahli" By all this Tahu couldn't listen to any more and he ignored Hahli and Jaller and focused on attacking and destroying the Borhok but the Borhok was the same type that attacked Tahu's village and it was a very, very destructiv and terrible type of Borhok and that was because he was the leader of the squad of Borhok and the borhok squad are very, very, very destructiv together and could kill nearly 350 Matoran and other residents in about 5 mins so Borhok are very, very ,very ,very, very, very, very, very, very destructiv squad (group) so Tahu is risking his life fighting this Borhok so he better keep his consoncration and also keep an eye on that borhok and whatch it dosent get Hahli or Jaller. Just then a fact went in Tahu's head and it was that he lived in ta-koro in Mata Nui and then a nother fact that Makuta owned all the Borhok in Mata Nui and owned all the bad bionicle's like some Rahi and Titan's in Mata Nui and was the cheef of them all, Fact's kept flying though Tahu's head and he had started to wonder did i have a life before this and if i did what was the name of it was calld Tahu or was poop or ampax or something and was i the same or differnet and was i a Matoran or a titan or even a bionicle from beyonde. With all this wondering Tahu lost consontration and the Borhok shot him with a Krana and then Tahu became evil. after Tahu been shot with a Krana and being controlled by a Krana the evil came though his body and and the Krana bounced of at the Borhok and destroyed it. 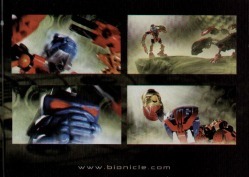 even know the Borhok had got the Kanohi mask when it blown up Tahu caught it "yes!" said Tahu "finally the mask is mine im putting this in the mask holder at my village"
"Now how do i get out of this place, weel there's just knowere to get out" said Tahu "Hold on i'll get Takua to help us get out of here" said Jaller "there's no bother Jaller i'lll just shoot and Walla, it will be hole in the sealling and we will be able to get out" said Tahu thinking he's a genius. "Ok then Tahu do what ya gotta do" BOOOM!!!!!! "Ou!! a bit of bark fell on my head from the sealling after i blown it up Ou!" said Tahu "So funny it was on your head it could of been on your sword and create some more fire" said Hahli "yeah it could" said Tahu. "anyway let's go back to the village and i'll put this mask in the mask holder and Jaller can do something, sound right?" "uhhhhhh yeah good, fair whatever" said Jaller "ok then lets go" As Jaller & Tahu walked through the Forest (to get back to the village you'll have to go through the village). "Hey Tahu there's Lewa up there" said Jaller "Really" said Tahu.i haven't seen Lewa yet but iv heard about him and Pohatu and Kopaka and Onua and Gali" "Lewa, Lewa....... are you there swinging in the tree's like a mad bionicle Lewa" said Tahu. "Yes whoever you are i can't see you at this speed" said Lewa. "Its Tahu, Leader of us six Toa" said Tahu "Nahhh it can't be your a little Motoran betending to be him, i know you, i just do" said Lewa "Well Lewa if your bothered to come down from the tree's and see me you'll know" "Will i, ok i will then i know your a little Matoran betending to be Tahu" said Lewa "so it wasn't a Matoran IT is Tahu......... "uhhhhh hi Tahu" said Lewa "hi" said Tahu have you been fighting any Borhok lately "nope, can't fined any" said Lewa " and by the way is that in your hand a Golden Kanohi Mask" "yes" said Tahu "REALLY, does that mean you've found your Golden Kanohi Mask" said Lewa in exitement "no way, that must of took you ages to find that, and were did you find it Tahu" "I found it when i was fighting a Borhok an hour ago (Maybe Two Hour's). said Tahu "Cool" said Lewa in more exitement than before "i Really so Really want to find one of them Mask's, or even just a silver mask i want to find one" "so bad you haven't" said Tahu "I know" said Lewa "anyway i have to put this mask in the mask holder ok" said Tahu " ok" said Lewa. So Tahu & Jaller went back to the village and put his Golden Kanohi mask in the mask holder. As Tahu & Jaller walked through the village to put the Kanohi in the holder Tahu spotted something "Uh Jaller Borhok have been through here" said Tahu frightend. "How do you know that" said Jaller "Becuase theres a Krana there and a Krana Here, and theres 100's of Krana's can't you see Jaller?" said Tahu "Yeah i can ahhhhh!!!!!!" said Jaller when a Borhok nearly shot him thith a Krana "uhh your right Tahu here are Bohrok here" It was too late Jaller was Hit by a Krana and was contolled by it!